Ali Daye is a second-year student in the Baker Masters of Real Estate Program. Prior to Cornell, Ali received a Masters in Construction Management from NC A&T State University. During his career in the construction industry, he was involved in the construction of many large-scale projects working for major construction management firms. Upon completion of the Baker Program, Ali intends to pursue a career in international real estate and development, with focus on sustainability, concentrating in the markets of the Gulf Cooperation Council. Inside the Gulf – Part 2 – This series of articles will explore several major projects taking place in the Persian Gulf countries. Saudi Arabian crown prince Muhammad bin Salman is currently on a tour of the West meeting with leaders from France, the United Kingdom and the United States. This is his first solo trip to the West since he was designated heir to the Saudi throne. His trip is seen as show of goodwill, following his anti-corruption crackdown, as he seeks to gain support from outside investors for his ambitious economic development plans. Many of these ambitious plans include investments in a number of massive development projects as Saudi Arabia continues its push toward economic diversification. It addition to new commercial investments Saudi Arabia is also looking to bolster its hospitality industry by expanding on what it calls “religious tourism”. This increase in religious tourism revolves around the expansion of Grand Mosque in Mecca which recently resumed after being shut down for two years as Saudi Arabia aims to grow the number of annual visitors by 12 million over the next 12 years. The effort to expand the Grand Mosque was initiated in 2011 by the late King Abdullah. The Grand Mosque in Mecca is the largest mosque in the world. It is the site where each of the 1 billion Muslims on the planet are obligated to make a pilgrimage to at least once in their lifetime. The expansion is a $10 billion effort to increase the mosque’s capacity to accommodate 2.5 million worshippers. However, the project was shut down in September of 2015 after a construction crane fell during a violent wind storm, killing 111 people and injuring 394 others. Since then Saudi Arabia has undergone significant political changes as the now 32-year-old crown prince handles the daily operations of running the country on behalf of his 82-year-old father, King Salman. In April of 2016 Crown Prince Muhammad bin Salman revealed the Vision 2030 plan that would chart a new direction for the country. In addition to a plethora of new investments throughout the country, including several new city building projects, Vision 2030 also highlights “religious tourism” as an essential aspect of future economic development. Following the crane accident in 2015, construction was completely halted. The Saudi BinLadin Group (SBG), the construction company responsible for the project, was stopped from taking on any new public contracts. The company was later put on trial for negligence and lack of safety standards. In October of last year, a Saudi court cleared the company of responsibility attributing the collapse to the violent wind from a thunderstorm. 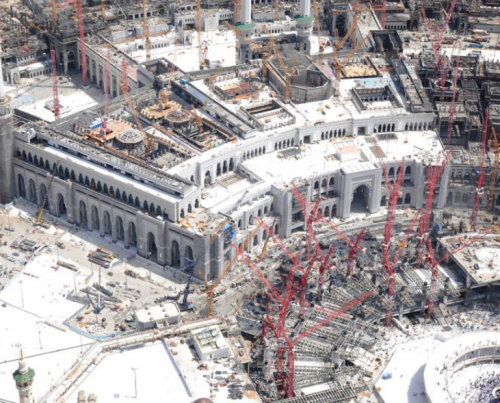 As a result, work on the Grand Mosque has resumed. The Grand Mosque has always been a major contributor to Saudi Arabia’s status as an international power and its expansion is pivotal as the country moves towards the future. Saudi Arabia contains Islam’s two most sacred cities, Mecca and Medina. The one billion Muslims around the world regard these cities as sacred as they are the sites where the Prophet Muhammad was born and where he later migrated to, respectively. The Saudi’s have always regarded the location of these sites within their border as a great responsibility, this is why every Saudi king is given the moniker of Custodian of the Two Holy Mosques. Today, Mecca receives 8 million visitors per year for hajj and umrah. Saudi Arabia looks to increase this number to 15 million by 2020 and 30 million by 2030. Currently, the Grand Mosque can accommodate 1.5 million worshippers. The expansion will increase that number to 2.5 million. The total area of the existing mosque is 3,830,000 square feet (356,000 square meters) while the new expansion increases that area by an additional 4,300,000 square feet (400,000 square meters). A new entrance named after King Abdullah will be built together with two new minarets, bringing the total to eleven. 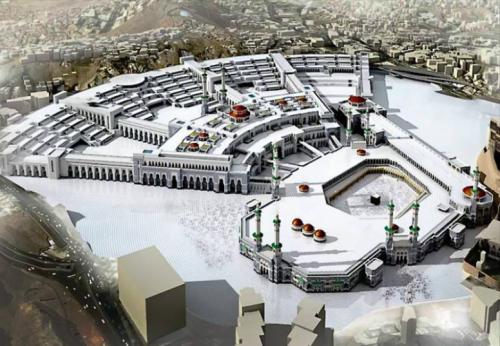 Once completed the expansion will improve the flow of pilgrims throughout the mosque which is often crowded during peak times such as hajj and Ramadan. In addition to the Grand Mosque expansion, several other projects in the vicinity highlight the importance Saudi Arabia is placing on religious tourism to bolster its economy. Many new hotel projects have either recently opened or are currently in development with several international hotel brands establishing a presence within the city. STR estimates that there are 23,000 guestrooms under construction with another 32,000 guestrooms in the pipeline. Below is an overview of some of the major projects around the Grand Mosque that accommodates the millions of visitors. 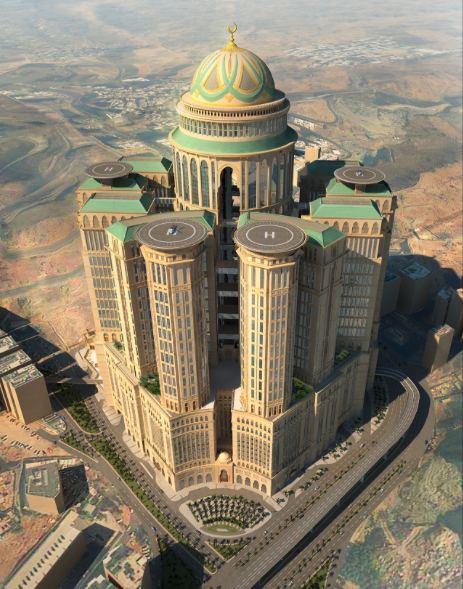 Completed in 2012, this government-owned mega-hotel complex is comprised of seven hotel towers and a shopping center and sits just outside of the Grand Mosque. 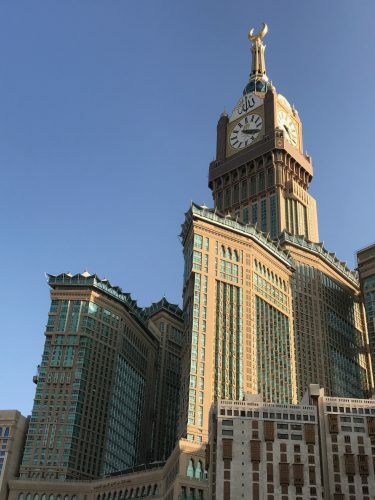 The centerpiece of the complex is it the Mecca Royal Clock Tower. Standing at over 1,906 feet, it is the world’s third tallest building and seven times the size of Big Ben in London. 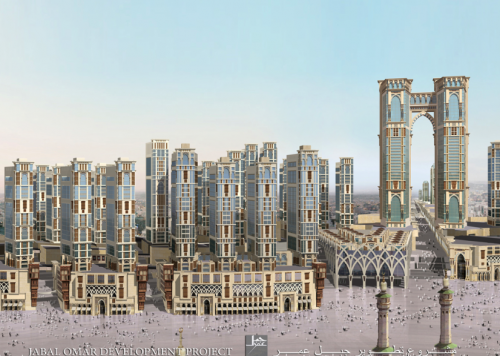 This mixed-used development within walking distance of the Grand Mosque is the flagship development of the Jebal Omar Development Corporation (JODC). Covering an area of 2,475,700 square feet (230,000 square meters) and including 39 towers, the site contains shopping malls, residential units and premium hotels with over 12,000 guest rooms. The hotels are owned by JODC and operated by international hotel brands such as Hilton, Hyatt, and Marriott. While in Dubai, executives from Jumeirah Group shared with Baker students future plans to operate one of the hotels in this development. Construction for this project has been halted due to the contractor, the Saud BinLadin Group having to lay off thousands of workers after the period during which it was suspended from taking on any public contracts. Originally scheduled to be completed in 2017, it is projected to be the largest hotel in the world consisting of a ring of 12 towers 45 stories high, with 10,000 bedrooms, 70 restaurants, and five rooftop helipads. 10 of the towers will provide four-star accommodations, while the other two towers will be reserved for special clientele offering five-star amenities. The project is estimated to cost $3.5 billion and cover approximately 15,069,474 square feet (1.4 million square meters). From the many projects that are currently underway or in development in the Kingdom it is clear that Saudi Arabia is taking significant steps to move away from its dependency on oil. Building upon its strength as the birthplace of Islam is a strategic move to diversify it economy. Establishing stability will also be critical as it seeks to bring in investment from the outside. Expanding its tourist industry has the potential to bring in billions of dollars in investments. As can be seen by the international hotel brands that have already signed on to operate in the city, Mecca will play a pivotal role in Saudi Arabia’s future development plans. Umrah is a voluntary pilgrimage that can be performed at any time throughout the year.